Alice & Jim | Love It or List It Galleries | Merit Kitchens Ltd.
Alice & Jim’s little bungalow was too small, and the space was proving to be a source of frustration when entertaining. 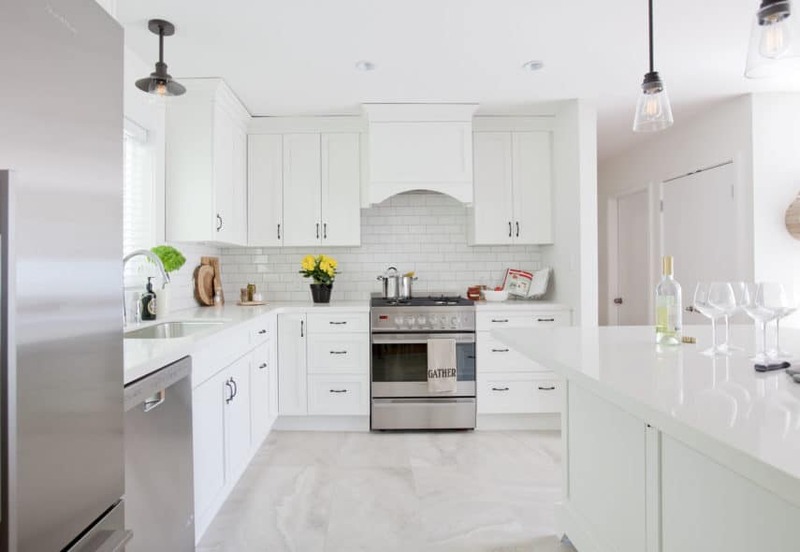 Jillian and the Love it or List it Vancouver design team were tasked with making the space as functional, and beautiful, as possible. The walls between the living room and kitchen, as well as between the dining room and kitchen, were removed. To allow for more cabinetry and storage, a window in the kitchen was moved and a doorway eliminated. Additional Details: The lovely decorative hood made from cabinetry creates a focal point for the space. The microwave is tucked away in a base cabinet in the island, below the countertop, to conceal the appliance and to free-up much needed counter space.